When visiting Mastodon Ridge, be sure stop in at the Local Shop & Market for an awesome selection of Atlantic Canadian food and beverages. The store sells local produce, baked goods, seafood, meat, deli and grocery items. We have Atlantic Canadian tea, coffee, maple syrup, honey, candy and much more! We also sell quality T-shirts and handcrafted items. Enjoy your favourite ice cream or frozen yogurt. We have a great selection! To keep up to date on what’s happening at the Local Shop & Market, check out our Mastodon Ridge website and follow us on Facebook and Instagram. Enjoy our Sunday Farmers’ Market at Mastodon Ridge! Join us each Sunday for local food, crafts and more. Enjoy the music, take a walk in the park, and be sure to visit the The Local Shop & Market. To keep up to date on what’s happening at Mastodon Ridge, check out our Mastodon Ridge website and follow us on Facebook and Instagram. 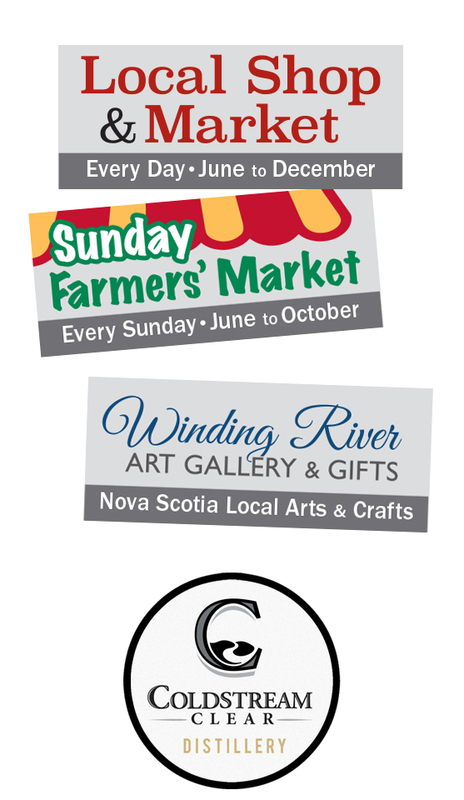 Hours – The market is open from 10am to 3pm every Sunday, from June to October. Stop in and visit the Winding River Art Gallery & Gifts, located on the second floor of Mastodon Ridge. This co-operative gallery of professional artists features a wide selection of artwork including paintings, pottery, jewelry, glass art, photography, wood and more. Learn more online at WindingRiverArtGallery.com and follow their social media. Locally owned and operated, Coldstream Clear Distillery is excited to share with you Nova Scotia’s best tasting spirits! Their premium products include Whiskey, Rum, Vodka and a variety of seasonal flavours. Stop by their Distillery store at Mastodon Ridge and discover their quality products for yourself. Learn more online at ColdstreamClear.com and follow their social media.